A system called RedEye will let you turn your iPhone or iPod touch into a universal remote control for your TV, stereo, cable box and DVD player. It will also work for any other device that receives standard (infrared) signals. As makers Thinkflood say, no more hunting around down the back of the sofa for the right remote. Buy a Red Eye dock and then download the RedEye app to your iPhone/iPod. The app lets you connect with the dock via wifi then the dock sends out the infra-red signals to your various devices. You can control any device from any room of your house and one touch launches any activity, the TV, switching the music on whatever. You can set the button to launch several devices simultaneously. Anyone in your house with an iPhone/iPod touch can use it as a controller and more than one controller can interact with your gear simultaneously. Useful, though of course it could provoke intense channel-surfing battles. 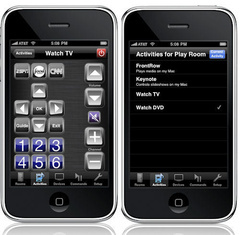 Fighting over the TV aside, this is really handy and each activity gets a custom control screen. Truly, one more reason that iPhones are becoming uber-gadgets.